If you know me at all you know I love thriftiness and re-purposing. 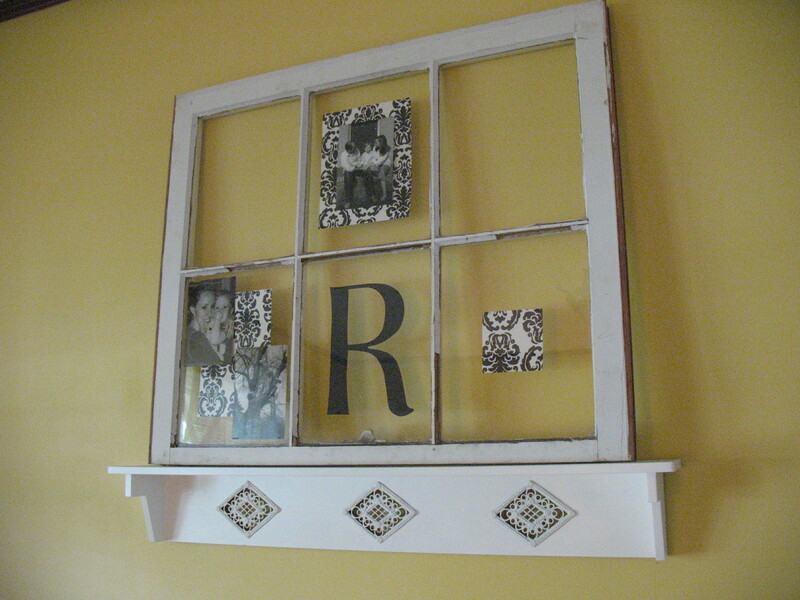 I have always wanted to have some old windows to decorate with. During one of our last few months living in TN, I happened to be driving out of our little neighborhood, and there happened to be these beautifully weathered old white windows leaning up against a mail box waiting for the trash truck and the owner happened to be on the porch and I happened to stop in the middle of the road…proceed to get out of my car and ask him if I could have them…and they just so happened to fit perfectly in my trunk. I bought the little shelf underneath it at a yardsale for $2.00. It was brown and gold before I took a can of spray paint to it. It holds my beloved window just perfectly! Because the windows were free, I already had the scrapbook paper left over from our wedding scrapbook, I used left over spray paint and I think I used some photo credits to order the pictures, making them free as well, this rather large, rather perfect for us wall decor cost us a total of $2.00. Pretty sweet. 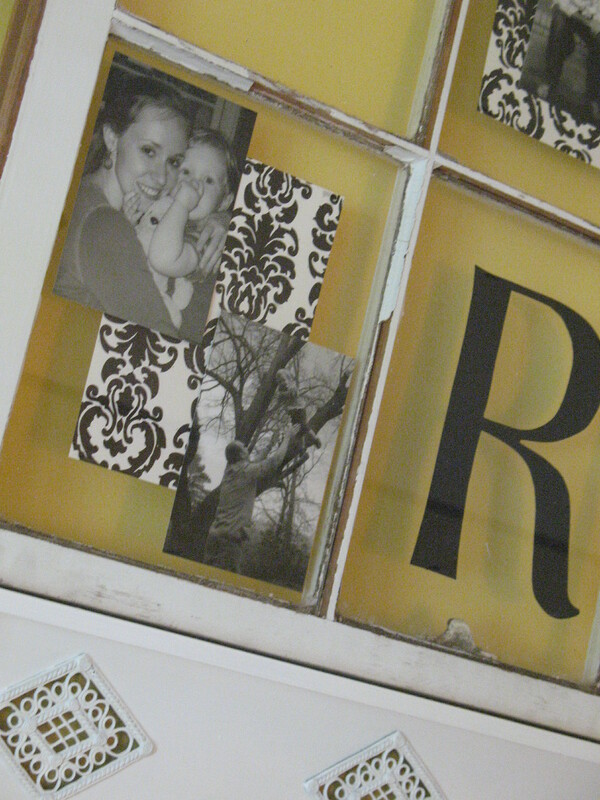 Click here to see her ‘sister’ window in our redone guest bedroom (Part 1 Part 2 and Part 3). 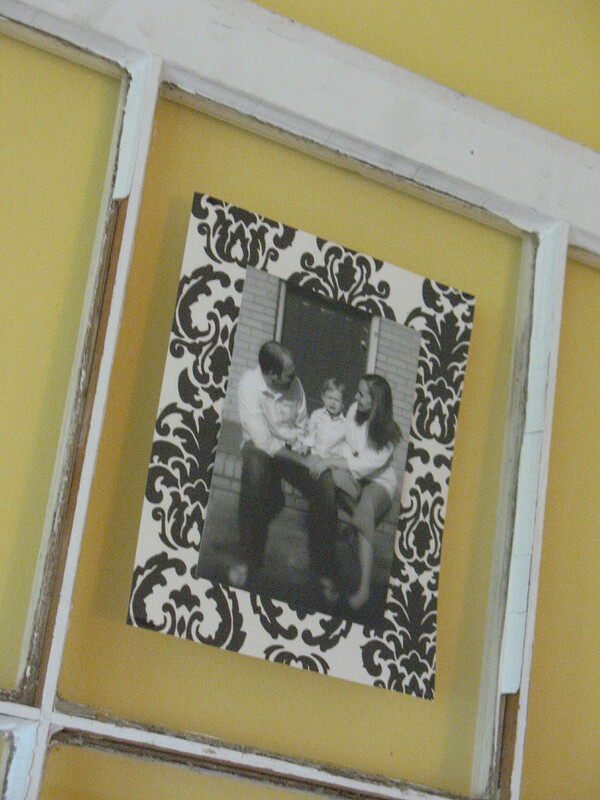 I did the same thing…picked up a white window and put some black and white pictures in it, but Luke helped me hang it without showing the wire in the back by putting 2 small names in each corner that the wire drapes over…making the wire behind it in more of a square shape instead of a V. I hope that makes sense. Just an idea for those who want to hang it! How did you get your pictures to stick in the window? Also, I think old windows are great baby shower gifts to close friends. You can put each one of their baby shower invitations in it and leave a spot for their birth announcement and the foot prints. I make sure to pick up windows I see in our neighborhood all the time! I’ve actually been on a jog, found one, and hauled it all way back home. I’m sure people wondered what I was doing! Ha! Thats a true thrifty decorator for you! Jogging with decor…its should be a new fad workout 🙂 Thats a great idea about the square type hanging with the wire. I was going to hang with some rope-ey type ribbon, but then found this shelf and liked it better. And hey, congrats on your lil’ Coplin! 🙂 So happy for you guys. I love it!! Too fun! Thanks for showing this!! It’s great. I love how y’all use old windows. mandy has one she painted turquoise blue in her bathroom with pictures. I’d hang one if I felt like I had space! Oh, and if I had one, too. I saw that when we talked on skype the other day. I started to mention it and I quess got on a different topic. It looks great! You are such the crafty person. I just came across your site with your wonderful old window and black & white photos. Very chic idea. 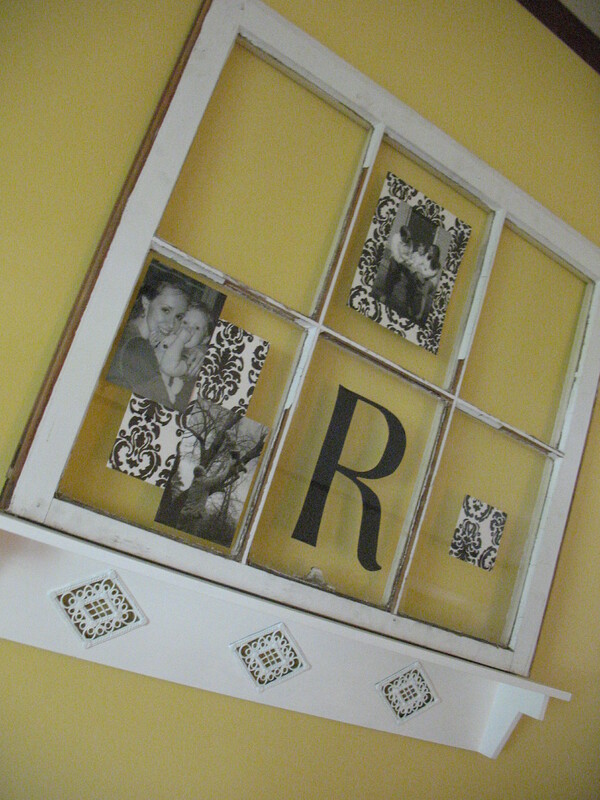 I just got a bunch of old windows and now I will attempt to decorate one like yours!!! That is darling. How did you adhere the pictures to the glass?